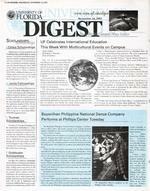 10,ALliGATOR,WEDNESDAY, NOVEMBER14,2001 usNewsSourceSCHO c% Ethics UF Celebrates Inter'national Education ThisWeekWithMulticultural Events on Camus.Bayanihan Philippine National DanceCompanyPerforms at Phillips Center TuesdaApplications are being accepted for the Prudential Ethics Scholarshipsforspring semester.The$2,000, need-based scholar shipsareawardedtosophomores and above who have a minimum 2.75 GPA and have taken, or currently are enrolled in, Agricul ture and Natural Resource Ethics(AEB4126), Ethics and Problems in Advertis ing (ADV 4931) or Ethics in Business (BUL 4930). Additional information, in cluding application forms, can be found online at www.honors.uf1.edu. The dead lineforapplicationsisNov.16.. Javits Fellowships.The U.S. DepartmentofEducationhasannounceditsJavits Fellowship Program for 2002. This program offersassitance to studentsofsuperior abilitiestoundertake graduate studiesfordoctorallevelor mas teroffineartsdegreesinselected fields ofthearts,humanities and social sciences.Theapplication deadlineisNov. 30. Ap plication formsareavailable in Grinter Hall, room 256. For information,call392 4829 or log on to www.ed.gov/offices/oPE/HEP /iegps/javits.html.Truman Guest column By EugeneL.Zdziarski, DeanofStudents ov.12-16isInternationalEducationWeekattheUniversityofFloridaandtheDivisionofStudentAffairsandtheInternationalCenterwouldlike toencourageall faculty, staf, andstudentstoparticipateintheprogramsandactivitiesthatareplanned.International Educacion Weekserves as opportunitytocelebratethediversityandrichnessoftheinternationalcommunitywithinourinstitution.TheInternational Studant AdvisoryBoard fortheInternationalCentermetwithStudentervices aftertheterrorist attacksonSept.11andcommunicated a need for greaterunderstandingandappreciationoftheinternationalcultures at the UniversityofFlorida.The programs andactivitiesplannedfor this week seeknotonlyto celebrate,butalsotoeducateandclarify manymisconceptionsand aboutourinternationalcommunity.Today.aHumanitarianDemonstrationisscheduledfrom10a.m.to 3p.m.inthePlazaoftheAmericas.TheeventissponsoredbyIslamonCampusaspartofIslamAwarenessMonth.Tonight,"Peace'throughPolitics,"ledbyMuneerFareed,isscheduledfrom6 to10p.m.inMcCartyHall,roomG186,aspartofIslamAwarenessMonth.OnThursday,IslamonCampuspresents"Afghanistan:aHumanitarianDisater"from10a.m.to 3p.m.atthe'PlazaoftheAmericasaspartofIslamAwarenessMonth.AlsoonThursday,Student Multicultural Affairspresents"AsianKaleidoscope:ComingintoFocu"from11a.m.to2p.m.attheReitzUnioncolonnade.Abrownbagforumon"tudyingintheUnitedStates: aperspectiveofUFinternationalstudents,"facilitatedbyCarlosHernandezisscheduledfornooninReitzUnion,room282.TheeventissponsoredbytheOfficeoftudentActivitiesandtheInternationalCenter.Thefilm"RushHour2"willbeshownat8and10:30p.m.tonight,ThursdayandSaturdayattheReitzUnionCinema.TheeventissponsoredbytheReitzUnionBoardandAsianKaleidoscope.OnFriday,the"AsianCulturalTalent snow," isscheduledfrom9 to11p.m.intheReitzUnionRionBallroom.TheeventissponsoredbyAsianKaleidoscopeaspartofGatorNights.TheHarry S. T roman Foundation of fers merit-based scholarships for college juniors with exceptional leadership poten tial who are committed to careersingov-'ernment, the nonprofit or advocacy St;C tors, education or elsewhere in the public service. Applications are being accepted through Jan.8.For information, visit the Honors Program at Tigert Hall, room 140. Criteriaforthe Truman scholarshipsisavailable online www.truman.gov.Goldwater ScholarshipsTheBarry M. Goldwater Scholarship and ExcellenceinEducation Foundation awards undergraduate scholarships in spring 2002. College juniors and seniors in the 2002-03 academic year, with intent to pur sue research and/or academic careers in mathematics, the natural sciences or engi neering (but notinmedical practice) are eligible. ApplicationsaredueinTigert Hall, room 140,onJan. 8. Applications and criteria are available online at www.acr.org/ goldwater. For information,call392-1519 .TheBayanihan Philippine ational Dance Company, a combina tionofethnic dance and creative growth in an exciting theatrical display, will perform at the Curtis M. Phillips Center for the Perform ing Arts at 8 p.m. Tuesday.Thedancers take the Gil a journeyoftraditional Philip -pi-I e lifethrough dance skills and intense vocals.Thedancers wear detailed, authentically styled costumes, from tribal war attire to ex0 quisite gowns.Thecompany performs celebratory rituals practiced by the tribal peoples who inhabit the northern-most islandofthe Philip pines. "Otheracts that were simply astounding were the featsofbalance and skillofthe dancers balancingonpoles with their bare feet," wrote reviewer Scott Boardman. "Every scenewaschoreographed and timed down to the second, which made this spectacular. "TheBayanihan Dance Companywasfounded in 1957aspartof the Philippine Women's University and takes its name from the ancient traditionofBayanihan, which signifies working to gether for the common good. From its first reviews at its 1958 Brussels World's Fair debuttoits current performing season, the dance com pany still awes crowds. Bayanihan has mounted15international toursandmore than 100 brief tours to international events and festivals covering 55 countries onfivecontinents.Thefirst Filipino group to performonBroadway, Bayanihan alsohasthe distinctionofbeing the first non-American dance companytotake to the stage at New York's Lincoln Center for the Performing Artsaswellasthe first Philippine cul,tural group to perform in Russia, theTheBayanihandancersperformatthe Phillips Center Tuesday.People's RepublicofChina and throughout South America.In'2000,BayanihanPhilippineationalDanceCompanywasofficiallydesignated,theNationalFolk Dance CompanyofthePhilippines.Ticketsrangefro m$ 10 to$15.Studentseatinginthebalconyis availablefor$6withvalidstudentID.Ticketsare availablebycallingthePhillipsCenterBoxoHiceat392ARTS,byvisitingtheUniversityBoxOfficeorbyvisitinganyTicketMasteroutlets.